This is a great book about how you can make a different in an organization by using and leverage trust in how you operate and behave in your organization. The author stated in the book “Trust flows from individuals, not organizations” and that is a fantastic summary of the book and really the reason to read it. 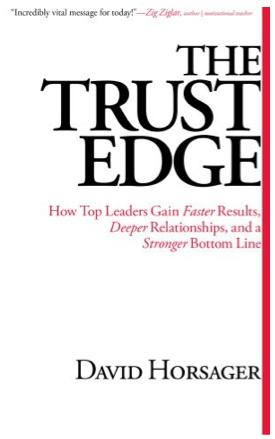 You can make a difference with how you use trust for yourself, your career and your organization and the trust edge is something that is available to anyway, independent of their organization as there is always room for trust. Surely different organizations will have barriers or roadblocks (as they all do) to how far or how quickly you can use the trust edge, but you can certainly make some room for it. Because of this, I think it is an excellent book to read and a lot of very wise advice and behaviors are outlined in the book, making it actionable and applicable to everyone, which I love about a great book. Clarity: People trust the clear and mistrust the ambiguous. Compassion: People put faith in those who care beyond themselves. Character: People notice those who do what is right over what is easy. Competency: People have confidence in those who stay fresh, relevant, and capable. Commitment: People believe in those who stand through adversity. Connection: People want to follow, buy from, and be around friends. Contribution: People immediately respond to results. Consistency: People love to see the little things done consistently. Trusted leaders are followed and these pillars allow a leader to develop genuine relationships and powerful reputations leading to higher revenues and success in the business. Horsager includes many useful and actionable segments in the book with questions to pose on yourself and summary steps to help you put more trust into the way you operate in business. These make the book much more applicable and his guides and methods are all very reasonable and useful to follow. Horsager based his book on findings from top company research and he provides many examples of how trust is a critical factor to the success of these great companies. Trust of the internal people and processes but also trust of the customer and vise versa. Customers will never stick around if they do not trust you and your company. So, I recommend this book to anyone interested in business, especially if you are interested in making and improving the trust and relationships you have internally and with customers, as it can make a huge impact on your success and enjoyment in your work. Tremendous post shared here by top writer.8 pillars of trusts are really million $ points to achieve in any professional organization. A book that I would really like to read, unfortunately my englska too poor to be able to bring in 100% of the book, hope it is translated into Swedish or Spanish. Sounds like a great read. Thanks for sharing, will have to look into buying a copy. Focus,determination,dedication and honesty is the key to get success in all fields.Thanks for such inspiring post here.